Use only one diaper pail, and do not put water in it. There is no need to rinse dirty diapers as long as baby is solely breast-fed. Once baby starts eating solids (or formula), the dirty diapers need to be rinsed in the toilet. Flushable, biodegradable diaper liners are also available to make clean-up a breeze. Wash diapers once the pail gets full which is every 2-3 days with only one baby in diapers. First, set the washer to run a medium sized load and do a cold/cold wash on the shortest possible cycle. If the diapers seem extra dirty or stinky, or if baby is sick, add either washing soda or baking soda to disinfect the diapers. Next, run a hot/ cold wash with the longest possible time. The hot water is necessary to get them really clean. A good detergent to use is ALL. (I’ve tried castille soap and a variety of other detergents, but they don’t seem to work as well.) Don’t use “free and clear” detergents because they have added ingredients which leave residues. Finish with a 2nd rinse with a big splash of white distilled vinegar. The vinegar helps get all the soap out, balances the Ph level, and softens the diapers. Using vinegar is optional. Hang them outside on the line when it’s not raining or snowing because the sun bleaches out stains and it’s also nice to dry them naturally. Don’t use bleach because it shortens the life of diapers. 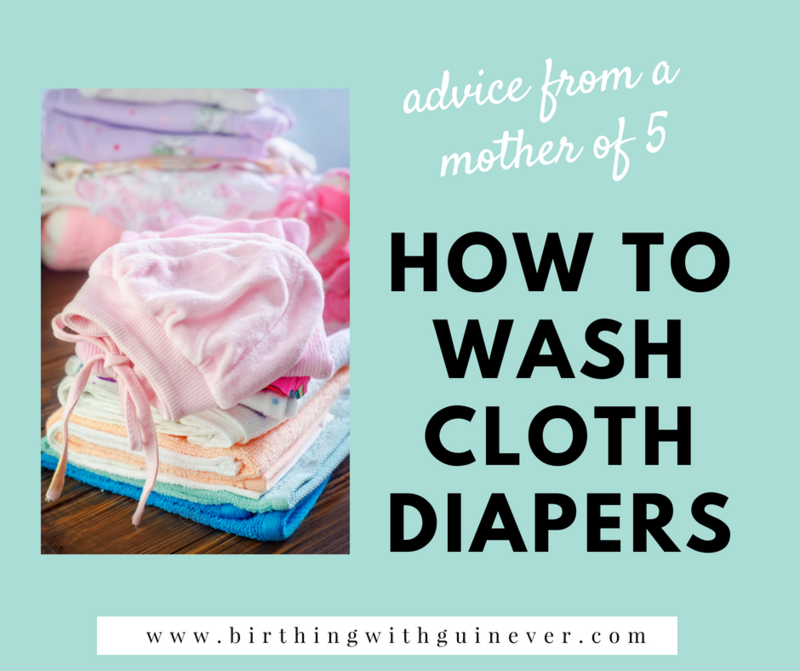 Bleach is harsh and corrosive and can make holes in your diapers, so it shouldn’t be used. Using a small amount of a product like oxy-clean when baby is sick kills the germs and bacteria. Don’t use fabric softener or dryer sheets because they leave a coating that is water resistant, thus making the diapers less absorbent. When baby wets, the wetness will bead up on the diapers, causing leaks. Don’t wash covers with your diapers because they can’t take the hot temperature. (A few covers can tolerate higher temperatures; just follow the manufacturer’s instructions.) You can just wash them with your light colored clothes and then hang them to dry. Most wool diaper covers require hand washing. For best results, use a rinse made especially for wool. Most diaper covers should not be put in the dryer because of the high temperature. If put in the dryer, they won’t be waterproof anymore which is not what you want! The high temperature in the dryer can also destroy Velcro if you have it on your diapers or covers.